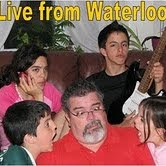 Live from Waterloo: WW#10 - VROOOM! I know, the matching outfits... Come on!!! It was the seventies!!! Oh, I just realized I mentioned this mustard coloured bike in one of my stories! Looks like the two of you had a lot of fun on your bikes! Is that a guitar you’re holding in the second photo? Hi Gabriel. These are delightful. And as another child of the 1970s, I hear you re. the fashion thing. I still cringe, though, when I see old photos of myself. What were my parents thinking? Hope you can drop by and say hi! I'm heading your way now! You were stylin' in your matching outfits! Great pictures! My mother used to make matching outfits for the two of us. Sometimes she made me matching outfits for me and my Barbies. The 70's! Matching outfits! But no perms? LOL! Talk about a time warp! Not only the outfits, but the machinery too. Man, what a difference a couple of decades makes. Evenso, both sets of kids are very cute, love the hair. Adorable!! sweet pictures and what great memories. 70's fashion disasters in Argentina as we did in the U.S. Even still...you two were hansome fellas. OH... kids will be dressing that way again. fashion circles like a buzzard. You were cuties!! My kids had bikes like that, too. Oh I'm diggin' the matching outfits hehe..
Hi gabriel, Its me Eds! Whow! you really still have these photos huh! very cute! Happy WW! I occasionally dress my daughters in matching outfits. I think it's cute. You guys are really too cute. Great photos! The guitar just tops off the 70's charm! wow cute.. it looks like you two had fun on your bike! Hi!That is avery sweet shot, for me, ha! You both really look alike...very sweet! Love the pictures, very classic! Great photo... and the outfits? Well, I think ANYONE over the age of 30 has similar images in similar outfits! Pu... donde estan mis fotos? Another child of the 70's checking in.. born in 74!!! Love these sorts of shots. They tell two stories: one of the subjects and one of the world at the time the photo was snapped. Happy WW. Love the bike I had one like it or very similar in powder blue. Great photos. My pictures this week are of my children when they were little. Seize the day! Love the photo Gabriel! I always look forward to your old photos! Hey and congrats on the weight loss! I am on that same journey! These are just to fun!!! Happy WW! My sister and I had matching outfits too when we were younger, lol. lol...love the outfits!! They are so 70's they are awesome! Thanks for stopping by - happy WW! Great photos! Very memorable. Happy WW. Lovely shots! These kind of photos are worth to keep. Happy WW! You are so much alike, you and your brother! Very cute pictures! Vroom indeed. Thanks for stopping by, and happy WW. I was here Gab, thanks for the drop! Ahh. I love old photo's. What does bro think of you posting him? Oh, the seventies! Brings back memories. Hermosas fotos y hermoso tiempo (sin lugar a dudas) donde uno podia salir a la calle a jugar tranquilo sin que pase nada. btw: our dish? Poisson Gratiné. What else - but a bad photo? Gabriel, the guitar in the photo is so small, I thought maybe it was something else, but I wasn't sure what. (Churango? Wrong shape. Ukulele? Probably not...) So I had to ask. It's neat that you come from a family of guitar players! I love old school photographs, great job on your two here. I'll have to do that one WW here soon...just have to scan some great pics of my Brother and I back in the day. Thanks for the great shots and memories!!! Those ARE some great looking outfits!! Looks fun...ah...how nice to look back eh? Happy (belated) WW! y la mayoria en ingles. Ya estas en las grandes ligas mi amigo. Que tiempos felices aquellos, la ni&ez en los 70's. Recuerda que tenemos exactamente la misma edad. No exageres, Arturo! Por lo general, los miércoles paso holgadamente las 200 visitas y los comentarios son muchísimos, pero eso es más que nada por los post de Wordless Wednesday. Que son populares, no hay duda; pero yo también me tomé el trabajo de visitar muchos sites para hacerme conocido. Muchas veces había comentado que me desilusionaba un poco la falta de lectores frecuentes que hablasen inglés, así que me puse en campaña; me fue demasiado bien, porque ahora se me está yendo un poquito de las manos la cosa... Fijate que ya tengo más de 200 comentaristas distintos, y recién estamos a 21 de mes. Los dos premios que gané recientemente (el CDN blog award y el de BlogCatalog) me sumaron muchísimo tráfico diario (sobre todo el segundo, porque muchos lectores de Filipinas, Malasia, USA y otros lugares ahora me leen diariamente). Pero al mismo tiempo, muchos de los que antes comentaban ahora han 'desaparecido' un poco, como Ana, Xel-Ha, Guillermo, Alfonso y algunos otros. Evidentemente, no puedo conformar o gustarle a todos. Pero sí estoy feliz con el blog en estos días. Las historias y las fotos que escribo tienen buena aceptación y me hacen sentir muy bien los comentarios bien intencionados. Eh, Arturo! Tu cuenta me da 31! Yo tengo 36.15 más impuestos. What great memories. Those photos are in amazingly good condition. Thank you for visiting! Looks like lots of fun and some great memories. gosh, they look just like my two in the '70s! Sure miss those days! Time flies. I often wonder what we're wearing today that will be despised in the future.